The first freeze of the season will threaten areas of the Northeast early this week, but seasonably mild air will make a return shortly after. An area of high pressure will build across the Northeast this week, yielding several dry days with a sunshine and a few clouds. However, there will be a seasonably cool feel to the air early in the week as northerly winds during the afternoons will keep temperatures 4-8 F below normal. Cool days will also lead to chilly nights early in the week that will officially put the growing season to an end for many people. 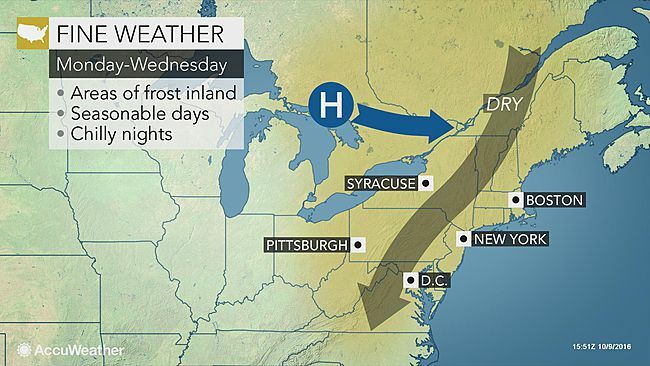 "Clear skies and calm winds will bring the first widespread frost and freeze to the interior Northeast early Tuesday morning," AccuWeather Meteorologist Andy Mussoline said. Temperatures are expected to dip into the upper 20s to lower 30s F across north-central Pennsylvania to northern New England and the St. Lawrence Valley Monday night into Tuesday. 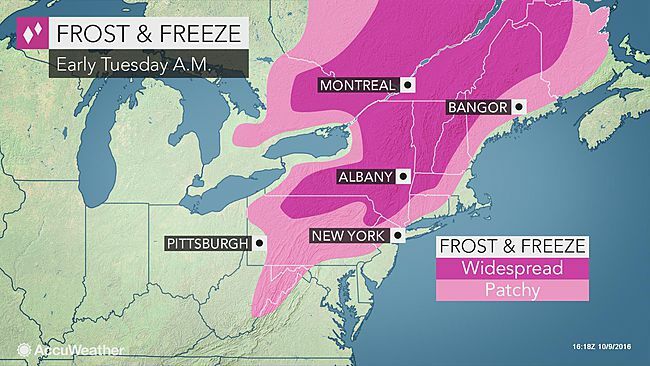 Meanwhile, patchy frost could develop elsewhere across the Northeast during this time. The only exception will be along the Great Lakes and from Interstate 95 to the coast where temperatures will stay in the upper 30s and lower 40s. Areas that had patchy frost back in September will likely see a freeze this time around. Despite the cool start to the week, temperatures will rebound during the second half of the week. "A brief warmup will occur late this week across the Northeast ahead of a weak cold front," Mussoline said. Wednesday and Thursday will likely be the warmest two days this week as temperatures climb to near- to above-average levels for mid-October. New York City to Washington DC will likely reach near or above 70 F while middle to upper 60s will be common farther west. The majority of the week will feature pleasant afternoons and early evenings. Those planning on heading out to enjoy fall festivals and activities should find the weather to be cooperative. It will be great weather to go on a hike and check out the beautiful fall foliage across New England. Trees are now entering peak colors across Vermont, New Hampshire and Maine. Folks that plan on being outside near or after sunset, will want to grab a sweatshirt or jacket as temperatures will quickly drop. Umbrellas will not be needed through Wednesday though. The only threat for precipitation will come Thursday into Friday when the weak cold front passes through. Widely-seperated showers will be possible across the Northeast, although the best chance will be across New England. Dry air will return quickly at the end of the week as high pressure builds back in. "Mainly dry and more seasonable conditions will settle back in Friday and into the upcoming weekend in wake of the front," Mussoline said.